I spent three months in the Soviet Union, interviewing veterans of the battle of Stalingrad. 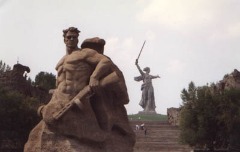 I visited the city, now called Volgograd, and its remarkable collection of memorials. 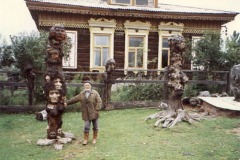 In Siberia, I met an amazing collection of people, some of whom inspired characters in the book. Most importantly, I was the last western journalist to speak with famous sniper Vasily Zaitsev before he died the following year, of a heart attack in his 80's. Here are a few photos from that incredible trip. Vera Andreievna Michailovna, the physical model for Tania Chernova. I met Vera in Irkutsk, Siberia. Peasants, thought Zaitsev, like me. We're all peasants. All the better. Accustomed to hardship. Zaitsev stepped before a tall, lithe blonde girl. He noted her stare. This, he thought, is no peasant. 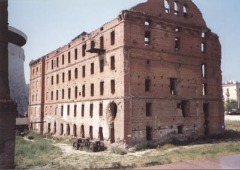 Mameyev Kurgan, in modern-day Volgograd, better known as Stalingrad. Two blocks of houses have been left in their battered state after the battle of Stalingrad. The museum with Zaitsev's sniper rifle is in the background.e your new text here. 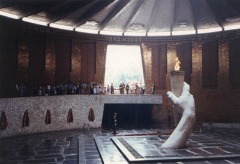 Inside the Hall Of Fallen Heroes at Stalingrad. The red mosaic banners on the walls bear the names of the battle's Soviet dead, almost a million of them. A craftsman and former political prisoner I met in Siberia, the inspiration for Yuri in War Of The Rats. At the top of his carved totem are Stalin and Levrenti Beria. Tania looked at Yuri's hand shake Fedya's. His fingers were thick and powerful with blunt nails. The knuckles were gnarled from labor. She guessed he had worked on one of the millions of Soviet collective farms. In Fedya's smooth white grasp, Yuri's calloused hand looked more like a tan bag of chestnuts than flesh.